Uber recently started its food delivery service Uber Eats in the Indian market. The brand roped in Alia Bhatt and Dhruv Sehgal for their ad campaign that definitely proved to be a great success. Dealing with a very typical way Indian households function where you tend to ignore vegetables like ‘Tinda’ and opt for ordering food, the brand essence was very well captured. The campaign garnered more than 50.3 million views and secured the first spot on the list of Top 10 Most Watched Indian Ads on YouTube in the month of January 2019. This ad wherein Vodafone showcased their unsung heroes, the network engineers who work tirelessly to ensure that you get a smooth network even at crowded places, connected quite well with the audience. This #StrongerEveryHour campaign garnered more than 37.9 million views helping it secure the second spot. To get audience attention during the Republic Day, Pepperfry showcased an ad to announce up to 50% off on most of their range and also offered 10% cashback on a few items. This ad garnered more than 19.2 million views. In support of cooks, Zomato designed this campaign wherein they promoted ‘No Cooking January’ urging people to give a full month holiday to their cooks while they order food from Zomato and up to 50% off via the app. The younger generation connected well with the ad and helped it get some 17.8 million views. Highlighting the intense flavors, deeper lines and more crunch in the LAY’S MAXX the new ad campaign got more than 16.9 million views, and it stands on the fifth spot on the list of Top 10 Most Watched Indian Ads on YouTube in the month of January 2019. Giving everyone a hope to win a gold coin every hour, the have faith in the #GoldenTimesWith7UP got more than 13.9 million views. This new ad campaign by TRESemme is aimed at only highlighting their additional freebie – a 2in1 Hair Curler-Straighter – that is available with the product. With more than 13 million views, it stands at the seventh spot on the list of Top 10 Most Watched Indian Ads on YouTube in the month of January 2019. This Kia Motors advertisement proved to be a delight for Nadal fans as it showcased how #RafaelNadal and fans are going to enjoy the global tennis festival with trippy bubbles all around the stadium. The ad garnered more than 12.3 million views. Playing high on the emotional content, HDFC life conveys a message that in life the most challenging times bring out the best in us. Making a great connection with the audience, the ad got 9.1 million views. The best part of the ad was showcasing Darpan Inani who is the first visually impaired Indian to win in his rating category. The campaign #BounceBack got more than 9.1 million views. The new Maybelline New York ad majorly features supermodel Gigi Hadid amongst others. The ad features their Superstay Matte product which stays intact for up to 16 hours and is now available in 20 shades. 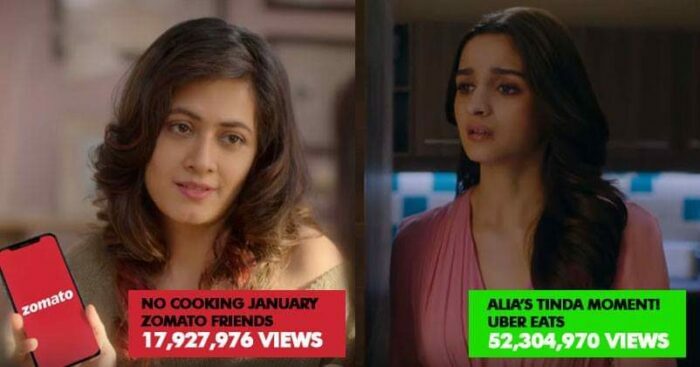 With more than 8.2 million views, it stands on the tenth spot on the list of Top 10 Most Watched Indian Ads on YouTube in the month of January 2019.